Psychedelic colors –pinks, yellows, orange, turquoise and greens—all mixed together in patterns of dots, circles, lines and squares became the fashion for the 60’s and 70’s. The jewelry of the time also reflected freedom of style and color. Gemstones were set “invisible” in jewelry to give the appearance of a seemless union of stones without the metal from the settings. The gold settings were underneath the stones and not visible on the front. The invisible setting was first created by Cartier in the 1920’s. The house of Van Cleef & Arpels patented the setting style which they called “mystery set jewels” and brought the invisible setting back in fashion in the 60’s & 70’s. Poiray, an independent French Jeweler, became known for his use of combining colors and textures that was unique in design and matched well with the clothes of the time. Man Ray, Pablo Picasso, Max Ernst, Andre Derain and Jean Arp began producing jewelry as wearable art objects that were popular because of their design rather than the value of stones themselves. 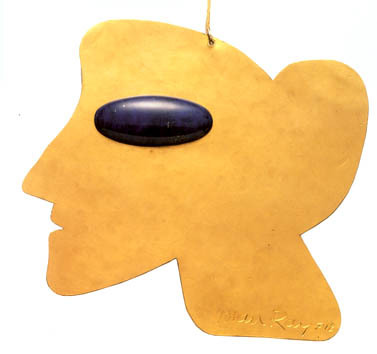 Man Ray created this necklace called “La Jolie” from his 1961 sketch. Made in 24k gold and Lapis Lazuli the simple outlines create a feel of energy and movement, a genius piece. This musical diamond and gold cuff bracelet was created by Arman, the famous French sculptor in 1989. One of the most incredible and important pieces in the collection is the famous Taj Mahal Diamond Necklace. A large heart shaped engraved diamond was given to the wife of Mogul Shah Jahan in whose memory the Taj Mahal was built in the 17th century. Richard Burton purchased it from Cartier in 1970 for Elizabeth Taylor’s fortieth birthday. Cartier redesigned the necklace to be set in 18k gold and rubies. Joel Arthur Rosenthal (known as JAR) is an American from New York who opened his studio in Paris on the Place Vendome. 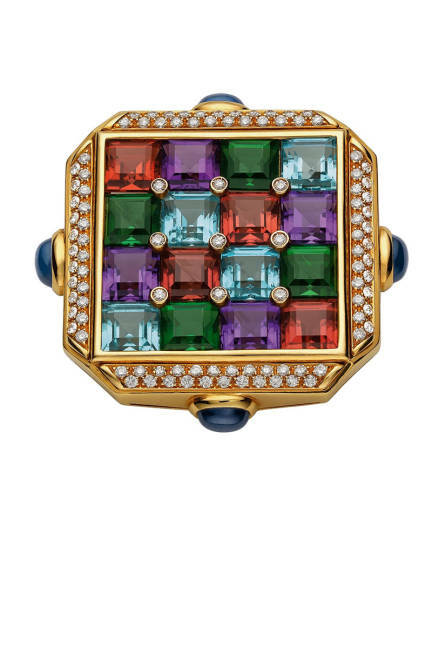 He quickly became known for his very detailed designed jewelry set in pave colorful stones. JAR’s jewelry on display included his beautiful all blue butterfly sapphire brooch and a cuff bracelet with colorful paved art noveau style flowers covering blue and purple titanium. 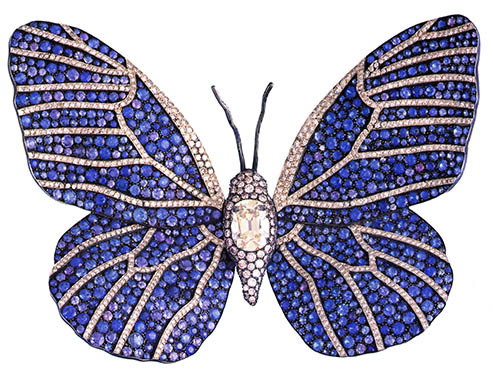 Cartier introduced the “Caresse d’Orchidees par Cartier” in 2005. This collection is from the Cartier archives of the art noveau orchid jewelry designed one hundred years ago. Independent French designer Lorenz Baumer creates very colorful, whimsical jewelry. According to Baumer, “Jewelry should be an experience.” On display was his detailed white gold bracelet with clusters of vegetable motifs created from multi-colored cabochon gems. The French Master collection ended with Boucheron’s art deco blue earrings, Baumer’s diamond chandelier earrings, Cartier’s orchid necklace paved in diamonds with a pink rubellite drop and finally a beautiful diamond collar with a large sapphire by Van Cleef & Arpels. All so beautiful and all so creative, the collection left me breathless. Many thanks to the National Jewelry Institute for putting this comprehensive collection of French Jewelry together and bringing it to the Legion of Honor.